RUSH: Let’s go back to the Grooveyard of Forgotten Sound Bites and the Grooveyard of Forgotten Hosts. Let’s see, this is… Ah! I’m sorry. It’s not from the Grooveyard. It’s from yesterday. 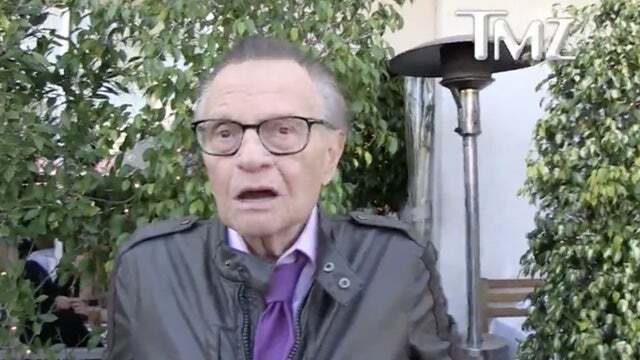 Yesterday on the TMZ website, an identified reporter ran into Larry King to get his reaction to Supreme Court justice John Paul Stevens’ op-ed calling for repeal of the Second Amendment. So the TMZ reporter said, “Retired Supreme Court justice John Paul Stevens advocating repealing the Second Amendment. What do you think,” Larry King? KING: I favor changing the Second Amendment. Repeal it! It’s poorly written. KING: You know who started the Second Amendment was southern senators so they could ward off slaves’ uprisings. KING: Read the history! Southern senators started it so they could repel slave uprisings — and the NRA is the worst. RUSH: (laughing) I wonder how many people who watched Larry King all of those years thought Larry King was not even political, that he was just a down-the-middle interviewer and all he did was ask great questions of people? Maybe he had a crush on Frank Sinatra, but aside from that, he was just a standard, ordinary guy. I wonder how many people had no idea that Larry King was just like all the rest of ’em: A left-wing radical activist who became more radical as he grew older? Well, those Southern senators were Democrats, Larry, old buddy, and they remained Democrats all the way through the ’64 Civil Rights Act, Larry, old buddy, old pal. But this is a new one. Have you ever heard this one? (interruption) Yeah. And where have you heard it? Where have you heard this idiocy? Yeah, of course from leftists. Revolutionary War? It was the Civil War, for crying out loud. But that doesn’t matter. The Civil War never happened. It was made up by right-wing media. TMZ: Larry King: Repeal the Second Amendment! It was Passed to Fight off Slaves!